January is music therapy advocacy month, with the theme “We are… Music Therapists!” In the realm of special education, with increasing focus on professional qualifications, it’s important that we, as music therapists, educate the community about our field and qualifications. To help with the cause, we’ve developed this free music therapy advocacy poster for special education. Click here or on the image below to download the PDF version of the poster. Through the combined efforts of The American Music Therapy Association and The Certification Board for Music Therapists, 2014 marks the 4th year of Music Therapy Social Media Advocacy Month! Throughout January, bloggers and podcasters are sharing their perspectives on music therapy, with this year’s theme being “We Are Music Therapists.” You can read a great blog post here on the vision behind this year’s advocacy month written by The American Music Therapy Association Director of Government Relations, Judy Simpson. While music therapy is a fully integrated service in some school districts, others may not be aware that music therapists not only have similar education requirements to speech therapists, occupational therapists, and other providers, but music therapy has also been recognized on a federal level as a service that must be provided at no cost to students in special education who require it. By empowering families and educators with knowledge about the profession of music therapy, we can not only help students access the services they can benefit from, but also help reduce inappropriate referrals for IEP teams considering what therapies may be required. In addition to the written recognition of music therapy as a related service by the Department of Education, we are excited that California is finalizing language that will legally specify music therapy as a related service, and Board Certified Music Therapists as special education providers. 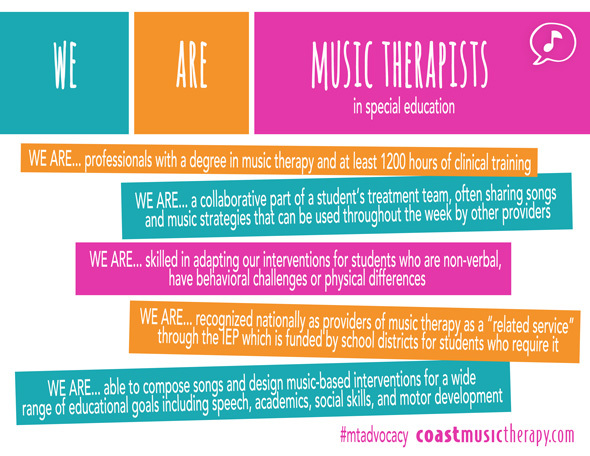 Coast Music Therapy currently has a staff of 11 music therapists and has served over 25 school districts in San Diego County providing IEP-based music therapy. The majority of our students have autism, cognitive impairments, or multiple disabilities and respond uniquely to music as a learning tool. Below you can find the facts from the “We Are Music Therapists” poster. Feel free to print and share with special educators, school district administrators and parents to help strengthen our profession and access to music therapy services in special education. 1. WE ARE… professionals with a degree in music therapy and at least 1200 hours of clinical training. 2. WE ARE… a collaborative part of a student‘s treatment team, often sharing songs and music strategies that can be used throughout the week by other providers. 3. WE ARE… skilled in adapting our interventions for students who are non-verbal, have behavioral challenges or physical differences. 4. WE ARE… recognized nationally as providers of music therapy as a “related service” through the IEP which is funded by school districts for students who require it. 5. WE ARE… able to compose songs and design music-based interventions for a wide range of educational goals including speech, academics, social skills, and motor development. 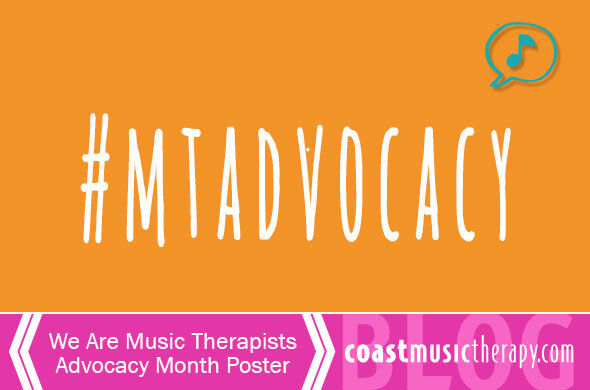 Use the hashtag #mtadvocacy to see what others are doing to advocate, or to share your own music therapy story.